Car Key Assist provide fast and efficient car key programming in Birmingham and across the West Midlands. 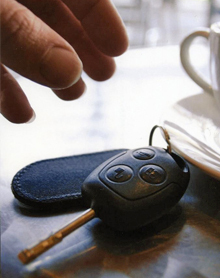 Since 1995, all cars keys have been fitted with an electronically-coded transponder. When a key is placed in the ignition, a code is read by the car sent by the transponder allowing the car to start. If the transponder chip is broken or missing, you won’t be able to start the engine. We offer car key programming services that mean if you have lost or broken your car key, we can ensure that your new car key is programmed with the correct code to ensure you are back on the road in the quickest time possible. Our expert automotive locksmiths use the latest key programming technology to supply and program transponder keys and remotes. Our programming services are also fully mobile, allowing us to provide assistance at the roadside, place of work or at home. Hundreds of happy customers across Birmingham and the Midlands can attest to our reliable and efficient services, dedicated to helping you get car remotes and keys working as fast as possible. We are able to provide key programming for a variety of leading manufacturers, including Ford, Volkswagen, Nissan, Fiat, Audi, Vauxhall and many more - contact us now on 0121 783 0442 to see if we can program keys for your car.